United Party for National Development (UPND) President Hakainde Hichilema has said that the voters in Solwezi and Lubansenshi have sent a have sent a powerful message to the Patriotic Front (PF) Government that using taxpayers money to corrupt the mind of voters will not work in 2016. In a message thanking his campaigners and all the people who turned out to vote, the UPND leader said that while his party may not have triumphed in Lubansenshi, the Party has managed to reduce the PF vote to less than 50% in the constituency, an area the PF had thought was still their stronghold, despite intimidation and threats. We would like to thank our campaigners and all the people who turned out to vote in yesterday’s parliamentary and ward by elections. Our fellow citizens in both Lubansenshi and Solwezi West braved violence, intimidation and threats to exercise their democratic right and vote for change that addresses the current economic challenges they are facing. In particular, the result of the Solwezi West parliamentary by election which saw our candidate Teddy Kasonso win with an overwhelming majority of more than 75%, shows that together we can triumph even in the face of police brutality and PF thuggery. Our congratulations go to the newly elected Hon Kasonso. We know he will serve the people of Solwezi West well even in the short time before the next elections. The voters of Solwezi West, and to a large extent Lubansenshi, have sent a powerful message to the PF Government that using taxpayers money to corrupt the mind of voters will not work in 2016. The pain is too much and the people are suffering. They have seen that the current PF Government does not care for the people. Look how they behave, instead of addressing the economic problems and challenges at home even the President himself is more concerned about travelling around, spending money on allowances while civil servants at home go without salaries. Despite falling short in the Lubansenshi parliamentary by election, Patrick Mucheleka was and still is a very strong candidate and the best for Lubansenshi. He did his best to retain that seat and continue serving the people of Lubansenshi, but that was not to be. I would like to urge Patrick to not lose heart, but forge ahead and continue serving the people of Lubansenshi as before. We all know that the PF is preoccupied with winning elections, after that they forget the people that put them in power. But we are consoled by the huge share increase in our numbers from January 2015 and this in the face of serious interference and manipulation that cannot be tolerated by the ECZ in 2016. The ECZ must learn from these by elections and make sure that those who flout electoral regulations such as vote buying are punished. Let us not forget that our campaign team in Lubansenshi were constantly being harassment and exposed to the violent behaviour by PF cadres during the campaign period. While we may not have triumphed the PF vote was reduced to less than 50% in the constituency. This in an area the PF had thought was still their stronghold! As more and more Zambians from across the country join our party we are better able to reveal this interference and manipulation by the PF. The trend is in our favour and in 2016 together we can win the elections and get started immediately on addressing the various important issues at hand, stabilising the economy, addressing management issues in the power sector, passing on oil price falls to the consumer, delivering the people-driven constitution and addressing the crisis in higher education. Fellow Zambians. Solwezi and Lubansenshi and a number of ward by elections have shown the way, amidst vote buying, brutality, intimidation they have shown that Zambians can rise up and correct things. Let us now get the voting instruments we need so that come 2016 we can vote together come rain or shine to move Zambia Forward. FODEP happy with Malambo, Petauke election results but…..
How I hate this shetanist. Wish he can just quit politics so that regionalism can stop. Without him people would’ve been voting based on issues . The moment he is going to leave politics even tryballism will end. Solwezi people have always been voting with a wrong motive and this explains why they are uncivilized and backwards. How will voting for upnd going to see them develop faster . sata was right. Mulimatako ba nzoro. INFACT ITS PF WHICH IS MAKING INROADS IN UPND STRONGHOLDS KOZ THEY GRABBED A SEAT FROM UPND IN MULOBEZI WESTERN PROVINCE IN JULY,AND WON 5 OUT OF 9 WARDS IN WESTERN PROVINCE. THEY HAVE ALSO GRABBED LUBASENSHI WHICH WAS HELD BY A UPND CADRE MUCHELEKA.NOT EVEN THE SO CALLED BEMBA TACTICIAN GBM KUD HELP THEM.SO WHICH INROADS MR HH? Pf stop consoling yourselves. Things aren’t good for u.
U always claim to win 7 Provinces & UPND in 3. But why is it that 3 provinces always give u sleepless nights in 2001(Mazoka) & 2015(HH)? In fact on both occasions UPND votes were stolen! In fact Central is never PF. You lost in Central 2015. Even Sata lost it in 2011. Lusaka was 60% to 40%. HH doesn’t need 30% from CB, Luapula & Northern to win it. He just needs 30% Lsk, 20% from CB, 15% Eastern, 10% from Northern/Muchinga & 5% from Luapula to clinch it. You claim to have won 7 provinces against somebody who only won 3 provinces & yet even with vote manipulation you just amass 27,000 extra votes. The economy is key, miners have just lost jobs. CB is cospolitan don’t just bank on your so called superior numbers. The economy is key, miners have just lost jobs. CB is cosmopolitan don’t just bank on your so called superior numbers. Now with the bad economy you should be foolish to think ECL will have a landslide. Even politically astute Sata cud not garner 43% national vote how can an amateur Lungu win by landslide amidst economic upheavals? Miners have lost jobs & u still count on them for maximum votes. Even the politically astute Sata cud not garner 43% of national vote in 2011 how can an amateur ECL win with landslide amidst economic upheavals? Okay Mr President of Southern State of Zambia. Good luck. THE PROBLEM WITH HH IS HE DOESENT LEARN,AND EVEN WEN THINGS ARE NOT OK,HE PUTS UP FAKE CONFIDENCE.NO WONDER HIS LOST 4 ELECTIONS.HOW IS HE MAKING INROADS WEN IN 2 BYE ELECTIONS CONDUCTED IN HIS SO CALLED PF STONGHOLDS,HE HAS KUM THIRD?IN THE MANSA BYE ELEXTION UPND CAME THIRD.NAWAKWI’S FDD DID BETTER THAN UPND AND CAME SECOND.IN LUBASENSHI WHICH WAS AN OPPOSITION SEAT IN THE SENSE THAT THE INCUMBENT HAS BEEN A UPND SUPPORTER,UPND CAME THIRD.THE INCUMBERNT MUCHELEKA LOST.A PF GUY CHIMUMBWA,HU IS FORMER MP FOR NCHANGA IN CHINGOLA,STOOD AS INDIPENDENT AND CAME THIRD BEATING UPND.SO WAT INROADS KOZ HTIS SEAT WAS HELD BYN A UPND MEMBER MUCHELEKA. But HH has his own personal aircrafts, so what? Which smile? They had to change the picture because even ba LT knew that he was looking like SATAN! Menso red monga nika papasha! Despite his pronouncements against regional politics, Lungu knows too well that politics all over the world and particularly in Africa are tribal and ethnic. Can an English vote for a Scot or Irish or Welsh as British Prime Minister in Britain? If majority populous of Lungu cousins on the Copper belt, Central, Luapula, Lusaka, EP, Mchinga and NP decide to go for Lungu, where did HH get the 50 +1% or even 45 + 1% of the vote? What in road is he dreaming about? Keep your stinking Bemba tribalism to yourself. Gordon Brown is a Scotman and he was PM. He was not even the first Scotsman to be at 10 Downing Street. Your tribal backwardness stinks. BACKTEETH U ARE AN *****.U ARE THE SAME FOOL HU INSULTED BEMBAS IN YO MORNING POST.TRIBALISM IN ZAMBIA IS SLOWLY BEIN REJECTED,BUT HAS REMAINED IN THE MINDS OF PIPO LIKE HH ND U.AS LONG AS HH IS PRESIDENT OF UPND,UPND WILL GO NO WERE.UPND IS A TRIBAL PARTY AND I APPEAL TO LOZIS TO REJECT IT KOZ GBM SAID A BEMBA SHUD HAVE BEEN VICE PRESIDENT.HE MADE THESE REMARKS IN THE PRESENCE OF HH HU NODED HIS HEAD IN AGREEMENT.SO HH ND GBM ARE TELLING US IT WAS A MISTAKE TO APPOINT A LOZI AS VICE PRESIDENT.HH IS NOT PRESIDENTIAL.MAYBE HH SHUD TRY BECOMING A MARKET CHAIRMAN. @Luapula premier thank you today you have acknowledged that you are tribal. An fortunately in Zambia there is no superior tribe we are well balanced and I know you are now scared of the out come next year 2016 because of your tribal inclination. I would like to urge all well meaning Bemba and Nyanjas never to be scared HH means well for Zambia he will look after you very well. You call that a nice smile like he is from sucking milk from the cows breast. kekekekeke ati…red eyes like a serpent…yaba you have made my afternoon! Okay this photo is just not on! Eish shetani mutuntulu! Easy hh……! Nothing to celebrate here…! U have won in your strong hold as expected! Grab a seat from Pf as it has grabbed Livingstone, Zambezi west and mulobezi from u…! Kasama will be the best litmus paper test for u…..let gbm contest…! Kaya! @EK these careless statements you are making against other tribes will cause you to loose. with all the ‘might’ and ‘influence’ of GeeBeeM you still came second to a mere independent candidate…mmm inroads???? Solwezi was expected really thats your stronghold or rather strangle-hold so what celebration? try harder coz your message is obviously not resonating in some parts of zambia. and dont forget spoilers like summer kabimba will steal your votes. good luck! HH lets me down a great deal.Is there anything to celebrate about? In as much as I would love to ve the economy and other challenges fixed,but HH doesnt inspire me because of his lack of ability to read between the lines. Instead of thinking of strategies to change this rigid voting pattern,he is rejoicing in the expected results .Surely,with this voting pattern,it is easy to predict victory for PF come 2016.His political sense of reasoning and analysis is very poor.Honestly,what has changed about the voting statistics here. PF is winning again next year!!!! reduce price of essential including mealie meal? If you do these then PF has a strong chance of continuing in government. Is there no other UPND MP or high ranking official that can be president of that party. HH is not just electable. He is like Rick Perry in the US. Wealthy but not presidential material. UPND really need to invest in proper Political Analysts and Strategists. Clearly the current ones are telling HH porkies! He has now become deluded that he will win next years elections with a landslide victory. It is a question of the glass being half full or half empty. Obviously HH is being optimistic by seeing the glass as half full. Statistics is the most abused subject. Out of the two seats UPND may have got more votes and can one therefore conclude that currently UPND is the more popular party. LT I am sure you have better photos of HH. But tha is HOW he looks, you want them to doctor the photos? Ngati ndiwe oipa ninshi niso che! PF is not controlling Central Province. Go ECZ website and see who won Central province, for info. it was HH in January 2015.Lusaka is changing as well. And you are forgetting that PF in 2015 January elections was so disorganized because of the Scottish man called Scot! What happen even then, President Lungu carried the day! Today, everyone and the whole armor of PF family is solidly behind President Lungu’s leadership. Lusaka has developed to an extent that we are now proud of staying in the city and this is because of PF good policies and not the opposition. HH has no future in politics, try other people at least within your own party, this is free advise anyway. Strategy includes acting weak when you are carrying a sledge hammer……don’t brag your strategy away like a spoilt kid ba UPND. My free advice to you is that allow PF to continue in their current belief that they are untouchable like Saddam and Gaddafi deluded themselves. And then when you are within striking distance, go for the jugular…..oh sorry am releasing the strategy that works!! But are you aware that the in 2011, HH only got 52 votes in the whole of Luapula Province?!!! UPND will lose in 2016. Zambia’s economy will be on its knees between 2016 and 2021 and most people will be fed up with the PF. In frustration Zambians will turn to UPND for solutions and they will give HH a landslide victory in 2021. Believe me or not, change is not coming in 2016. THE BIGGESWT TRAGEDY TO HAVE EVER BEFALLEN ZAMBIAN POLITICS,WAS THE DEATH OF MAZOKA.MAZOKA RAN AN INCLUSIVE PARTY WHICH MADE UPND WIN IN 5 PROVINCES WESTERN,SOUTHERN,LUSAKA,CENTRAL AND NORHWESTERN.EVEN IN KASAMA AND COPPERBELT UPND DID WELL AND BEAT FDD AND HERITAGE.INFACT MAZOKA WON THE ELECTIONS AND CHILUBA JUST STOLE THE VOTE FOR MWANAWASA.MAZOKA LEFT 55 MPS WEN HE DIED.UNDER HH UPND HAS LESS THAN THIRTY MPS AND HAS BECOME NOTHING BUT A REGIONAL PARTY.PF HAS A SEAT IN ALL UPND STONGHOLDS IE SOUTHERN,WESTERN AND NORHTWESTERN.HH HAS DESTROYED UPND.POLITICS OF TRIBE ARE LONG GONE.COPPERBELT IS A MIXED TRIBAL PROVINCE WERE TONGAS HAVE MARRIED BEMBAS.HOW DO U EXPECT THEM TO SUPPORT SUCH A PARTY? ba HH will not go anywhere,why do you like giving people fake hope? lubansenshi was not for PF but that tribal seat in solwezi was for the opposition as always.you will cry 2016,kaili you will only win in your tribal 3 provinces. Its really shocking that there are people who are still seeing development in PF government! Frankly speaking it is not development you are seeing in PF but the hate you have for HH because of your uncivilized way of looking at issues! So in your own wisdom you think it will pain HH when you vote for useless Lungu! He won’t feel anything. It is you Kaponyas who are scratching for a living who are constantly feeling the heat after everything has gone up! Thats a fact you can’t run away from! Okay, leave us alone as Kaponyas and go with your HH and GBM with your money. We don’t need your money! Why should force us to vote for someone we surely know is not capable of running the affairs of our country? HH and UPND twalimikana, period! Try other things other than politics. And the more you insult us the more you will pay dearly. Its not HH or GBM who have raised and sent our children to school, NO, its us with our humble PF Presidents Mr. Sata and Edgar Chagwa Lungu. HH and GBM can spend all their money on their families its okay with us. We would rather be happy that sad because of selfish individuals. THE MESSAGE TODAY AND IN NEAR FUTURE IS WE DONT HH AND HIS ARROGANCY, POMPOSITY AND SELF IMPOSED LEADERSHIP! What is development in your mind? Zambia is developing and in every sane person knows that. May be UPND have a different definition. You failing to provide for your family has nothing to do with development. Even in America, Germany and Japan there are people that fail to meet their needs. With DSTV everywhere people know what is causing the current hardships in many economies and your lies will not make change their minds. But why can’t UPND ever win a parliamentary seat in the North/East circuit while PF wins in the South/West circuit – Mongu central, Livingstone Central, Mulobezi, Mangango & Zambezi West? What has PF done for those constituencies? Mongu-Kalabo road is MMD project, Mongu Stadium & University still on paper, Livingstone developed by MMD, Pf just did finishing touches for UNWTO assembly. Mangango, Mulobezi & Zambezi still waiting for communication towers. Even Effron Lungu’s Chama North despite giving PF 1st MP in Eastern is forgotten. Only Luapula, Northern & esp Muchinga have seen much despite being economically unproductive. CB & Lsk have benefitted because of their Bemba connection. So it does not pay to vote PF if the area is Non-Bemba land! Could be you are not in Zambia. PF through Lubinda lobbing brought UNTO to Zambia and not MMD. Township Roads are being made in Mazabuka, Choma, Monze. Nico-Monze road is being tarred. There are about 40 RHCs under construction in Southern province. New districts and provincial offices being made. What will make you understand the PF are working. When we say that HH and the opposition are no match to President Lungu and PF, others think we just joking, no we are very serious. Even in these hard times, people believe in PF and its administration because we all understand that challenges are there for a purpose and that purpose is for us to think outside the box, lets critically and analyze these challenges and find out the long lasting solutions to them. And mind you, whatever we come up as solutions, these need to be well thought out and sustainable. Where are you making inroads? Be realistic with yourselves…you will not come close in these areas especially with the money FQM is pumping in those NW areas; the rural person doesn’t know the difference and doesn’t care hence easily misinformed. You need to strategise and wake up from your folly…they won’t be a next time, you can not simply put your bets on the economy failing…PF have borrowed money to misuse and use to their advantage. As for HH to think he has made inroads in PF strongholds is a very serious lapse on his side. In Lubansenshi for instance, PF has grabbed that seat from its former MP who is now in UPND! And when you critically analyse, UPND has been white washed because the guy who came number two is a PF member who stood as independent. Assuming this Chimumbwa was disciplined and had campaigned for the PF candidate, the results are that all those votes are in favour of PF, so HH must be retired NOW because the man is a liability to his party. HISTORICALLY, LUSAKA HAS BEEN NYANJA / NGONI SPEAKING. 60% NEVER VOTED FOR SATA. THE SAME FOR LALAS IN CENTRAL. THE NAKED TRUTH IS HH SHALL NEVER GO TO PLOT ONE. PERIOD. GORDON BROWN WAS INSTALLED LIKE LEVY AND RUPIAH. Its really shocking that there are people who are still seeing development in PF government! Frankly speaking it is not development you are seeing in PF but the hate you have for HH because of your uncivilized way of looking at issues! So in your own wisdom you think it will pain HH when you vote for useless Lungu! He won’t feel anything. It is you Kaponyas who are scratching for a living who are constantly feeling the heat after everything has gone up! Thats a fact you can’t run away from!! What is your definition for development? Check it out on Google. HH should be worried that the voting pattern in Zambia has not changed since EL came into power. The pattern as it is favors Lungu. Something bigger than loadsheding, kwacha, economy needs to happen before 2016 to change this pattern. The number of votes Edgar Lungu is polling in N. Western Province leaves one to wonder if the UPND will manage similar margins as was the case in January. Frankly, I bend toward the PF just edging the UPND again. which product is produced by the northerner, is it ifisashi, kalundwe or intoyo? Ifinkubala from Mpika, TuNakonde Rice & Kolwe meat. For that they get a bigger chunk of national cake largely collected from Solwezi (Kanshashi, Lumwana & now Kalumbila). Okay this party should just try someone else, I know there are people inside there who want to have a go at the Presidency, but for some reasons best known to themselves they cannot just come out in the open. To me this is a case of trying to show the Zed people that all is well in the party when infact not! Keep on chocking with envy HH and UPND will continue to move forward.Even if you yap we shall don’t care because we know victory is around the corner.Only Fontinis like still believe in tribal voting.In 2016 the youths will decide not old voters have tested this hypothesis.Zambia is transforming. It’s people like you that give HH false hope and when he loses ati baba ma vote, simply put HH is not sellable! Comment: People Who Reason Can’t Say Nonsence Things On HH The Best Man For Zambia. How Can You Praise Aspoiller Who Has Is Just Taking The Nation Backwards? He Has Failled Already. Never Talk Foolish On The On Coming Republican Presdent. You Be Ashamed To see His Succes. During His Reighn After 2016. Don’t Remain Behind Just Open Your Eyes You Who Are Stil Blind. Yeah right. For someone who when asked by the devil on the day of Judgement “what did you spend your life doing on earth?” His answer will include “I lost ten Presidential elections”. Hopefully by then you’ll be able to construct a sentence better than a 3 year old. Dream on! Insulting Bemba voters is like insulting the crocodile while still swimming in deep waters! 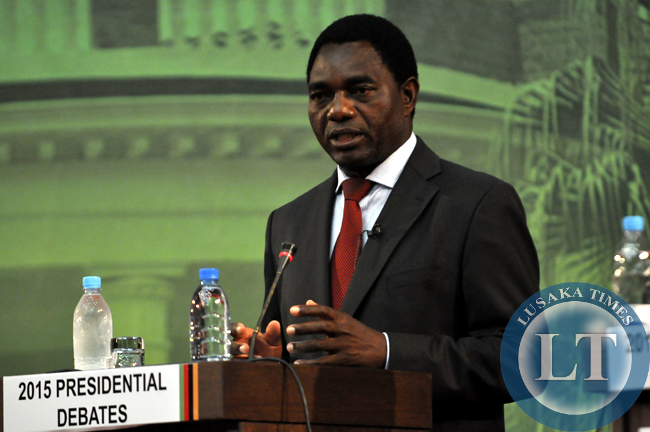 HH needs to focus on Central & Eastern province. Copperbelt is another potential but not Lupula and northern provinces – these people love poverty & problems. Bembas and akumawa are just like the Bantu Botatwe; they vote for their own. And nothing will change in 2016. So Northern, Luapula, Muchinga and Eastern Province will vote Lungu’s PF, though UPND will this time score decently. HH will pocket Western, Southern, North Western and south Central (Soli and Lenje lands) Provinces. The battle lines are Lusaka and Copperbelt. Will the PF win the two giants in face of the economic swamp they have driven Zambians into? HH is hell bent on getting his name entered in the Guinness Book of World Records as the ‘Most Prolific Presidential Elections Loser’. So let him get his wish. If the chap was a Football Manager he would have been sacked by now, but in UPNDs case he owns the team so nothing will change. Is it possible to have transparent ballot boxes both for holding unused ballot papers and for voters to place their votes in to avoid accusations of ballot stuffing. To the rational Zambians why did Mucheleka lose the election is it because of non performance in his constituency and nothing to show for the CDF if applicable, if that is the case using the same benchmarks why did Dora Siliya and Kapembwa Simbao win. Some rational answers are needed. HH, I hope that is a correct analysis in Lubansenshi at least. It could be the impact of a strong candidate Mucheleka rather than the impact of UPND. For HH to be president,Tongas ought to change their tribalistic tendancies period. People saw how u massively and tribally voted for HH in January,so dont expect other tribes especially Easterners and Bembas to vote for HH because the trend was seen and set by TONGAS! Come 2016,its victory for PF as usual and no chance for opposition!!! Comment: immagine oppening a mine whilst empliyees ar working loosing their jobs lncomplete road makin sure guys? @ Chishimba; To begin with,u re not chishimba,u must be Hamiyanze or Himoonde and u re upnd.Dont think u can blind fold us! And by the way,where is flight HH 2015? You people that are saying hh and UPND will win in 2016. i don’t think so, one thing BA UPND is forgetting is the way southern people voted, the same method will be used so that you have a test of your own medicine. No crying. And dont compare 2016 elections to previous ones. HH is very short sighted…..The way Southern province voted in Jan 2015 is the same way the rest of the Country will vote in 2016.UPND alone can not win elections.He lost chance in 2011 when he was supposed to be working with Sata during the pact days.The selfishness to break away means the man is just chasing wind.No one region in this country can make one President…..hence….ONE ZAMBIA ONE NATION. It shocks me to observe that even our traditional leaders in one well known region who were supposed to be uniting the nation are always supporting one presidential candidate openly in the media.This is not good for this country and i feel bad because in reality they are disadvantaging this candidate to people from other regions. Ba UPND if you want to govern Zambia, pls look for a different president ,not hh…. he is to tribal and this will finish him. Pls go to his house now ! If you think iam just making up things. Pipo, you like it or not 2016 PF must go and HH must take over dont tolk too much. Who is going to vote for PF? remember RB bwezani banda where is he? can you wotch and see!!!!!!!!!! !